I have been so busy with moving. My mom is in town and she has been helping me redo our place. Literally the last 2 days we shopped till we dropped! It has been so fun and and also exhausting. Our new place is coming together slowly but surely. And my closet is done!! Since I have moved I haven't had time to really do my hair or paint my nails. So this is how my hair has been for the last few days! I ran into Forever 21 while at the mall shopping at pottery barn (my favorite store) and saw this sweater and grabbed it without trying it on. But I knew I would love it!! I hope you all are having a great week. I can't believe it is Wednesday already. Where does the time go? Ps here is a picture Matt took from our balcony before the sun came up! It is not edited! How did I get so lucky to wake up to this everyday? Adorable!! Love the striped top you wore under this too! Great look. It sounds like you and your mom had an amazing time. Holy cow I LOVE that sweater! Sooo cute! I love this mustache sweater! and your view is just amazing! That sweater is too. freaking. cute! 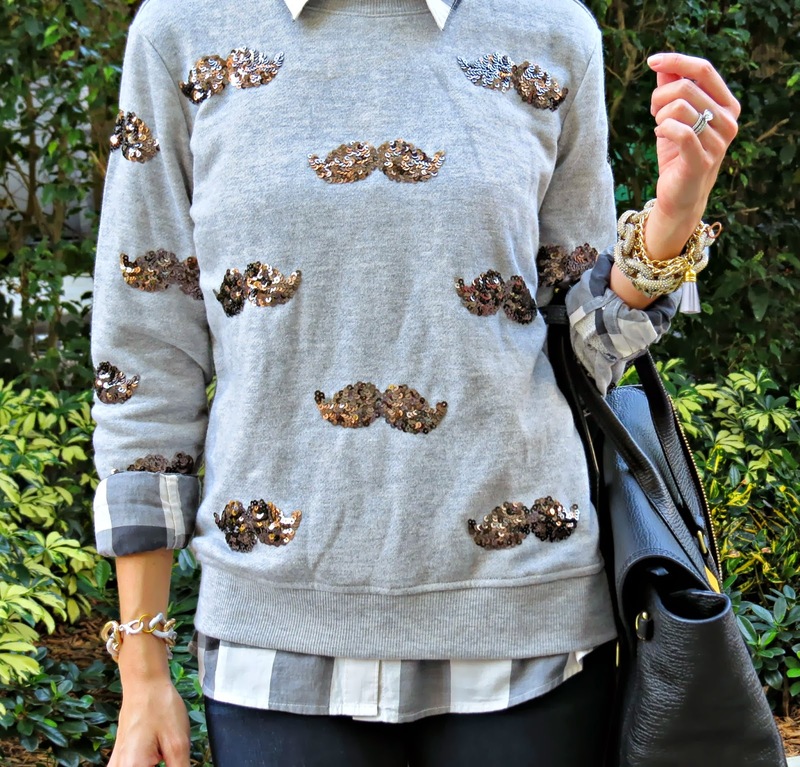 I love those little mustaches and it pairs perfectly with your plaid shirt. Love love this sweater! So cute with the gingham under and those silver shoes! Beautiful view! I can't get over how much I love your style! I see your outfits on Instagram and you always look so cute! Love that sweater! So cute! First, the view out your apartment window is amazing! Next, I totally want those shoes! I'm a huge wedge fan and the silver is fantastic! wow that view is absolutely breathtaking!! and you always manage to layer so well, i need to take note!